The Mustang is directed by Laure de Clermont-Tonnerre. The film stars Matthias Schoenaerts, Jason Mitchell, Gideon Adlon, Connie Britton and Bruce Dern. Despite what the title may lead you to believe, The Mustang is not a film about World War II fighter planes or vintage muscle cars. Roman Coleman is serving a sentence in a Nevada prison, being returned to the general population following a stint in solitary confinement, who has a rocky relationship with his estranged daughter, who periodically visits. Upon being assigned to outdoor work detail, he’s eventually given a chance in an equestrian program to tame wild mustangs for auction. Despite his initial misgivings and an uneasy relationship with many fellow inmates, including those in the program, he finds a purpose, preparing the animals for the next auction. The Mustang is, basically, a gritty R-rated version of Free Willy that swaps out a juvenile delinquent for a prison inmate serving a long sentence, and a whale for a wild horse. Although that description may deter you, don’t let it. This is a surprisingly effective and dramatic character study with many brilliant moments, a strong cast, and a well-rounded and developed leading man, even if the third act commits the blunder of shoe-horning in too much in the way of last-minute drama. 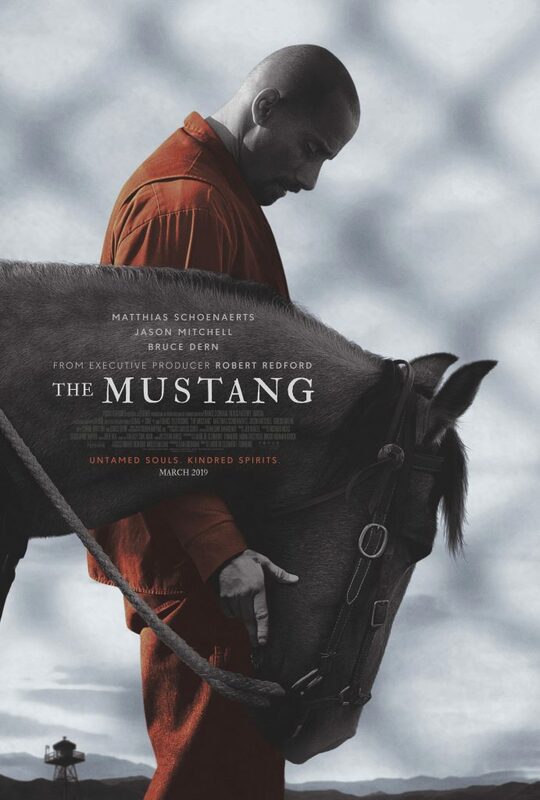 Where The Mustang is strongest is in its leading man, prison inmate Roman Coleman, portrayed by Matthias Schoenaerts. The film is a carefully-paced character study, and thankfully not an exploitative piece that makes a caricature of the overused archetype of the prison inmate, something all too commonly seen in films. Coleman is a man clearly frustrated by his prison sentence, but one who also knows how to “bite his tongue” and not lash out at those he deals with within the detention center. While he has his share of outbursts and moments of torment, he’s much more interesting because of how he’s portrayed here. By the end of the movie, I found myself rooting for this guy despite his past detestable actions. 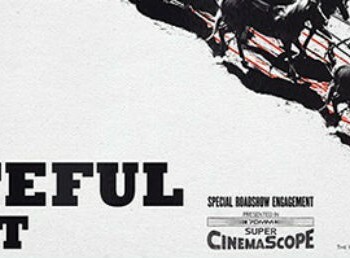 While Coleman is the primary emphasis of the film, there is a strong supporting cast, including veteran actor Bruce Dern as the man in charge of the mustang domestication and auction program Coleman finds himself a part of, and Jason Mitchell as a fellow inmate long experienced in the program. Gideon Adlon (daughter of famed voiceover actress Pamela Segall Adlon) has a fairly minor but impactful role as Coleman’s daughter. The movie rightfully keeps the cast to a comfortable minimum. The movie is carefully paced and serves as character study rather than an action-packed thrill ride, and the approach taken by director Clermont-Tonnerre works exceedingly well for the most part, especially given her relative inexperience as a director (a look at her IMDb will reveal primarily short film and television directorial credits, with this being her first feature-length theatrical film). At just over 90 minutes, it tells a very full story without being overblown, overlong or reaching too far or feeling preachy. The few things which weigh the movie down are the presence of a few too many subplots which never get the exploration they deserve or feel unnecessary, and the attempt to shoe-horn in far too much unnecessary drama and an ending not worthy of the otherwise fantastic film (though I have to keep the wording limited here to avoid spoilers). 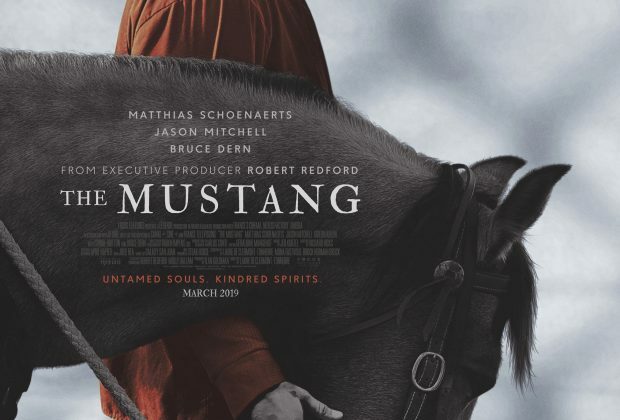 Despite its few minor shortcomings, The Mustang is a solid and dramatic character study moved by excellent direction and pacing, and a superb and believable leading man who never makes him character come off as a caricature or overdone. It’s well worth seeing despite the minor flaws. DISCLAIMER: Images in this review are the property of their respective copyright holders, including Legende Films, Umedia, Ufund, Canal+, Cine+, Nexus Factory, and Focus Features. For promotional use only. All rights reserved. Battle Beast Releases "No More Hollywood Endings"
The Hateful Eight - Should You Go See Quentin Tarantino's Latest Film? The Quireboys - Classic British Rockers Return With Twisted Love! TailGun - Comin' in Hot is the First Record From the Vegas Rock Band! The Zombies - British Invasion Favorites Return with Still Got That Hunger!